In today’s world of shrinking media budgets and finite attention spans, how can we produce complex, long-term, nuanced journalism? Metrography, Iraq’s first photo agency, offers a possible solution. In today&#8217;s world of shrinking media budgets and finite attention spans, how can we produce complex, long-term, nuanced journalism? Metrography, Iraq&#8217;s first photo agency, offers a possible solution. It has been some years now that the media industry has been trying to find new ways to sustain the production of quality journalism from remote areas in spite of the ongoing economic crisis. The old model, which consisted of flying photographers around the world to report on conflicts doesn’t appear to be sustainable. Furthermore, due to the shrinking budgets of media outlets, the reporting that still can be done is at risk of being quick and shallow, lacking the necessary in-depth knowledge and research. Even for those photojournalists that survive, their work as reporters is tightly constrained by the short time they can spend on a story. This condition limits their access to the various aspects of multi-layered issues. The result is an oversimplification of complex dynamics in an ongoing crisis. However, greater access to technology, affordable high quality equipment and widespread internet access have made it possible for local photographers to play a new, crucial role in the production of news and stories from crisis contexts. Benefiting from unprecedented access—and with almost no need of intermediaries such as fixers or translators—the local photographers can spend as long as possible reporting on issues that are difficult to reach for traveling journalists. Metrography, the first and only independent Iraqi photo agency, was founded in 2009 by American photojournalist Sebastian Meyer and Iraqi photographer Kamaran Najm with this concept in mind. Najm and Meyer shared the idea that great photojournalism comes from concerned and dedicated photographers, irrespective of their nationality. Based in Sualymaniyah, in the Kurdistan region of Iraq, Metrography has provided local photographers with the kind of training that was missing in the area and made it possible for many of them to reach international standards of professionalism and publish their work widely. Since the outburst of the latest Iraqi crisis in 2014, the photographers of the agency have reported on the most diverse aspects of the conflict, providing an unprecedented documentation of the current events. But what makes their work most valuable is the fact that they stayed and kept reporting after the media attention moved onto other subjects. While most of the international photojournalists were pulling out, Metrography committed to telling the hidden face of the war: the subsequent humanitarian catastrophe of the three million displaced Iraqis. These projects, gathered together in the collective undertaking, ”Map of Displacement” tell the story of the latest wave of Iraqis forced from their homes due to the new reign of violence sweeping through their country. It is the story of the enormous human toll civilians are paying in Iraq while war continues to ravage their country. Through intimate narratives of these people who have been violently forced to flee, Map of Displacement illustrates the magnitude and poignancy of this underreported crisis. By pairing international writers with local photographers (under the guidance of Metrography editors Stefano Carini and Dario Bosio), the members of Metrography have created the most comprehensive and in-depth account on the Iraqi IDP crisis. Besides the is an attempt to empower the local photojournalists to tell the stories of their own country. Editors’ Note: “Map of Displacement” has just been launched as an interactive website featuring photo, text and video elements! It will be presented officially on October13, 2015 at the Parsons School of Design in New York City and then be available to the public thereafter. 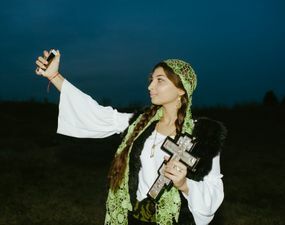 In these photographs, witchcraft is shown in its 21st-century guise, documenting the social-media savvy entrepreneurs of Romania’s thriving witch scene and their eye-catching aesthetics. A timely rumination on Southern American culture through a photographer’s personal journey of confronting illness in her family and facing her conflicted relationship with the region itself. 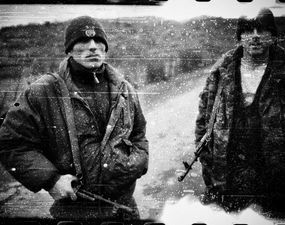 A cinematic horror story of wars and conflicts around the world over the past two decades, as seen through the eyes and lenses of a master photographer. 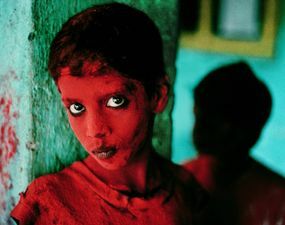 Video featuring Steve McCurry — see him in action on city streets, talking about his approach to photography. 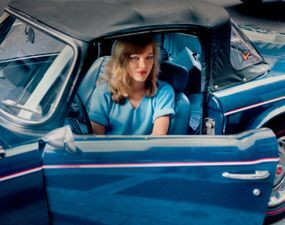 A photobook by Robert Herman reveals stunning street photography in New York City from the 1980s. See 25 photos in a full-screen slideshow. 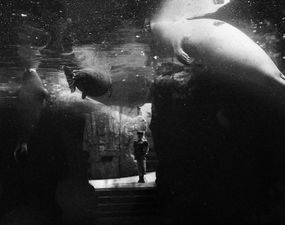 A dreamlike domain tests the limits of our perception: in these images, humans and alien creatures coexist in an uncharted, in-between, liquid-black realm.